Now that spring time is finally here, we can expect warmer weather with sudden bursts of April showers. This warming up brings more people outside to enjoy the sun, but it also brings out the insects and animals that have been in hibernation for the past couple of winter months. One of the worst pests is the termites. As a homeowner, you need a plan to safeguard your home against these pests. Unlike popular belief, termite season does not actually have a beginning and an end. Termites can attack a home any time of the year, especially in warmer regions. In cooler climates, they become less active during winter months and then are visible again come spring time. Most people only become aware of the presence of termites in their homes once they detect a swarm, which typically happens from April to May. Springtime signals the start of the swarm season, where termites suddenly appear out of seemingly nowhere in large droves. The combination of warm weather and April showers at the beginning of spring allows the termites to leave their colony in large numbers. Swarming termites will suddenly disappear as fast as they suddenly appeared, which may give you a false sense of security that they are gone for good. The disappearance is due to the fact that some of the termites die after swarming. But even if termites are no longer swarming around, this does not mean that the pest is gone for good. A termite swarm is an indication that there is a nest or a colony nearby. This termite colony could be hiding inside your home and gnawing quietly. So once you see one, you should start looking into prevention and treatment strategies to protect your home at all costs. A swarm usually happens during warm weather that has been followed by a quick outburst of rain. Although swarmers are not the termites that actually destroy a home, these are indicators of an infestation nearby. 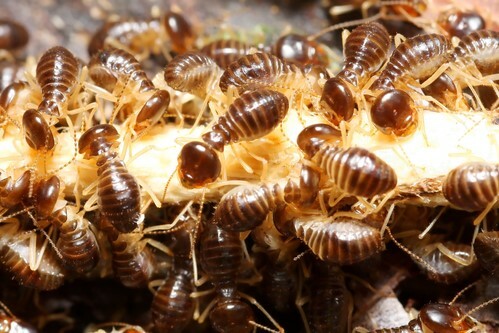 Swarmers are the termites that mate and reproduce while the working termites are the ones that destroy a home. Termites that are swarming are in the process of beginning a new colony. As a termite colony grows old, it produces alate nymphs that will later turn into winged termites. Once they become fully grown, these termites fly away from the colony through mud tubes and then swarm while in search of a mate. When the termites’ wings begin to drop off, they start to mate with their partner. One of the female members of the swarm will then become queen of the newly-formed colony. She will begin laying eggs which will eventually hatch and turn into worker termites. Here is how to make your home an unlikely target for termites. Remove food sources. Dead, rotting wood that contains cellulose are the termites’ main source of food. Remove stored firewood, wood mulch, and any other wood products away from your house perimeters. Clean out brush around the house. Unkempt vegetation could be a breeding ground for swarms, so always make it a point to prune shrubs and small trees, and cut back on bushes. Eliminate moisture. Moisture is attractive to a termite as a flower is to a bee. Seal up and caulk any opening in your doors and windows, fix leaky roofs, and keep the attic, basement, and crawl spaces well ventilated to prevent moisture from seeping in. Treat the foundation. Check any cracks in your building’s foundation and treat them accordingly to prevent moisture and pests from coming inside. Call a professional. While you might be tempted to do the work on your own in order to save money, it often takes the work of a tried-and-tested professional to fully remove any form of pest infestation within a home. It is advised to take prevention steps in order to protect your property against termites and to prevent structural damage to your home. You may want to reach out to a local pest control company for more information.